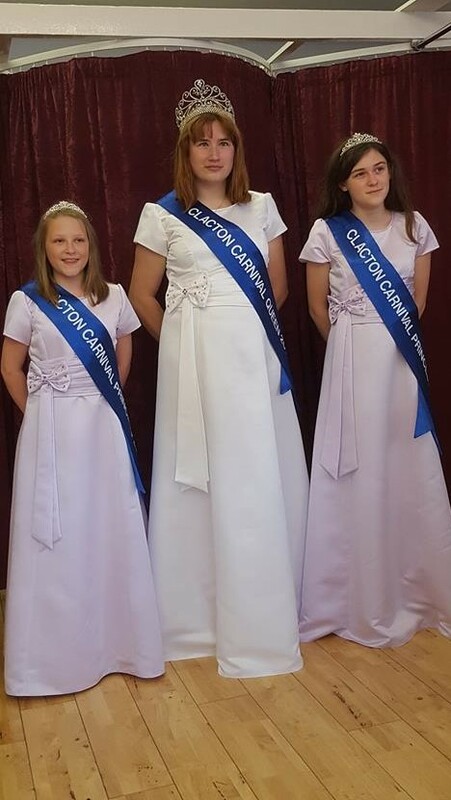 Hello everybody, My name is Louise Primmer and I have the pleasure of being your Clacton Carnival Queen 2017 with my Beautiful Princesses Kaycie and Hannah. I am18 and I am currently studying Level 2 Hairdressing at Colchester Institute. Although in September, I have a university place at University of Suffolk to study Film Productions as i hope that my future job is something in the film industry. Outside of College, I help organise socials for Camra Young Members as I am Tendrings Young Member officer. I would like to take this opportunity to thank the Judges for picking me and the princesses for this years court. Also a big well done to Teegan, Leah and Jessie for last year, you lot did a amazing job. 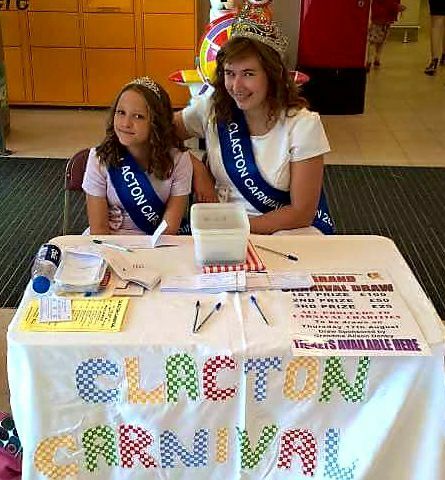 Come see Kaycie, Hannah and I throughout the summer representing Clacton at other Carnivals and events. Don't forget that our carnival week starts on the 12th August starting with the Street Procession! Bring the summer on! After last nights surreal events at selection night, I had the great opportunity in meeting up with Kaicie and Hannah to do a photo shoot for the newspaper. We had an amazing time taking photos and getting to know them more. As well as this, we got to meet and talk to our Chaperones for the year, Carol, Mandy, Jenine and Amy (who unfortunately couldn't make it today.) where they told us what would be happening throughout the year. Dress Fitting- 18th April 2017! Exactly 3 weeks after our first visit to Beautiful Brides, I was so excited to be able to try on my stunning dress for the first time. although it wasn't completely finished yet, it was amazing to be able to see how much they had done in the space of 3 weeks! Thank you Beautiful Brides for making our dresses! It is something I am sure to treasure forever! Today's the day! Our first carnival of the season. I woke up bright and early and got ready for the day ahead. When I was picked up, I travelled to Brightlingsea on my own as Carol, our chaperone, couldn't attend, so the princesses and I travelled in separate vehicles. When I first arrived, I saw the amazing float, a big thank you to the Davey Family for designing the stunning float for our year ahead. The day went on and the weather was obviously on Brightlingsea's side today as it was extremely hot. As the parade drew nearer, the judges came over and awarded me with 2nd for queen of queens, then what made the day better, was that they then came and awarded Kaycie and Hannah, my princesses, with 1st for Best court. To win not just one thing, but two at our first carnival was amazing, I wasn't expecting it! We were absolutely thrilled! As the procession lead of on its route, we were excited, I was in control of the music on the float so we were bouncing along to our favourite songs, along the route we saw familiar faces. The procession soon came to the end. After we saw all the other courts in, we took photos and soon was off to queen teas where we had a bit of food and drink, and thanked Brightlingsea for inviting us to their amazing day. After one more talk to all the other courts, we said goodbye and headed back to Clacton. I would like to take this opportunity to thank Debbie for driving the float, Jenine and Mum for being our chaperones, Victoria and Ellamy for driving the girls, and Brightlingsea Carnival for inviting us! Next week: Great Bentley Carnival! Today, the girls and I attended Great Bentley Carnival. After waking up early, Carol picked us all up just after 10.00 from Hannah's as her mum Victoria, very kindly offered to do all of our hairs for today. It was nice to be able to get ready with everyone. When we arrived, we went to take some photos and spoke to the other courts until it was nearly time for judging, we went then and sat on our float waiting for the judges to come around. Soon enough, the judges came and was asking questions about our float and dresses, including on when our carnival was. After they had chance to go and speak to every court, the judges came back over and awarded us with 2nd best visiting court. We were all gob smacked! We weren't expecting to win anything! The day went on, the carnival procession moved off and the weather stayed on our side today. As queen teas came to an end, we said goodbye to all the courts and went on our way. I would like to thank Debbie, for driving the float, Carol and Jenine for being our chapperones for today and Victoria for doing our hair so nice. Next event: Poster/Colouring presentation evening! Tonight, Kaycie, Hannah and I had the privilege of giving the prizes to the winners for the Clacton Carnival Colouring Competition. This year, the event was at Rascals, who were very kind to step in at last minute after our old sponsor had to drop out. 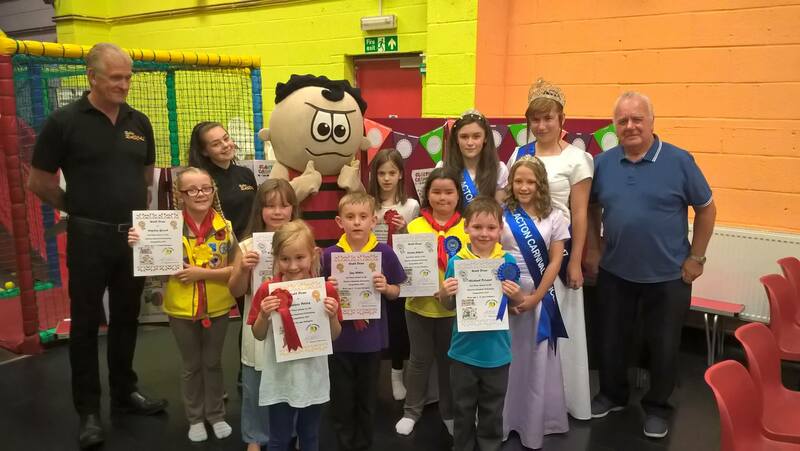 All the entries were up to a very high standard so the Judges must have had a tough time with picking the winners! It was nice to see so many people who came to the event, and with so many familiar faces who were on the committee was nice to see. For me, Rascals could have not been a better place to hold the event, the owner had come over to us and talked to us about who were going to be in the mascot costumes and let us meet them beforehand as one of the princesses has a phobia of mascots, this couldn't of gone better as she was alright for the whole night because of this, we were all so happy. After the prizes was presented, I went and sat with Carol and talked to her while Kaycie and Hannah had a go on the equipment. The night ended and it was time to go home. It could of not gone any better. I would like to thank Carol for being our chaperone, all the winners for attending, the committee and a special thanks to Rascals. Today, the Princesses and I attended Witham Carnival, I was especially really excited to attend as this would be my first time going. I got picked up around 8am by Victoria because she had kindly agreed to do all our hair again, she made us all look stunning, as usual! 2 hours later, we got in the car and began our journey to Witham. As we got there after a long journey of singing and talking to one another, we were welcomed by both Witham courts as their carnival is a little different to ours where their old court also joins in. After talking to them for a little while, we walked around the field talking to the other courts that we had met already but also making sure we introduced ourselves to the other courts. As we still had a while before judging, we began talking to Aliya and Scarlett, the court of Great Bentley, as they had an open roof car, and it was a nice a bright sunny day, they sat on our float with us. It wasn't long before judging began. After a long wait of anticipation, the judges came back over and awarded us 1st Place for Best Visiting Court Float. We were absolutely thrilled as we didn't think we would win anything. It wasn't long then before the procession. As the procession came to the end and our hands hurt from waving at the busy crowds so much, it was so nice to see so many people who was out on the route. As the day came to the end, and we had been in queen teas, we said goodbye to the other courts and headed back home. I would like to thank the following people: Debbie, for driving our float, Jenine for being our chaperone, Ellamy for being our official driver for today, Victoria for doing our hair, Teegan, Last year’s Queen for coming and walking beside the float and all at Witham Carnival. Next event: Raffle ticket selling at Little Clacton Morrisons! Myself and Princess Hannah this morning went and helped Debbie West sell raffle tickets for the Clacton Carnival Grand draw as Kaycie was unable to attend due to illness, we missed you! It was so nice to see so many people supporting the draw and buying tickets, some even brought whole books! It was also nice to see some familiar faces who I had grown up around, some I haven't seen in years, including past queens for years back telling me what a wonderful experience being on the court was from them and wished us the best of luck. Special thanks to: Carol and Debbie West for looking after us, Jenine for driving us there, Victoria for doing our hair, and anyone who brought a ticket or gave us money as all your support is wonderful, because of you, we raised £185! I hope Princess Kaycie is feeling better now and will be alright for next Saturday as we are attending: Felixstowe Carnival! H: This morning we woke up to the sad news that our lovely Queen Louise was too poorly to come with us to Felixstowe Carnival. 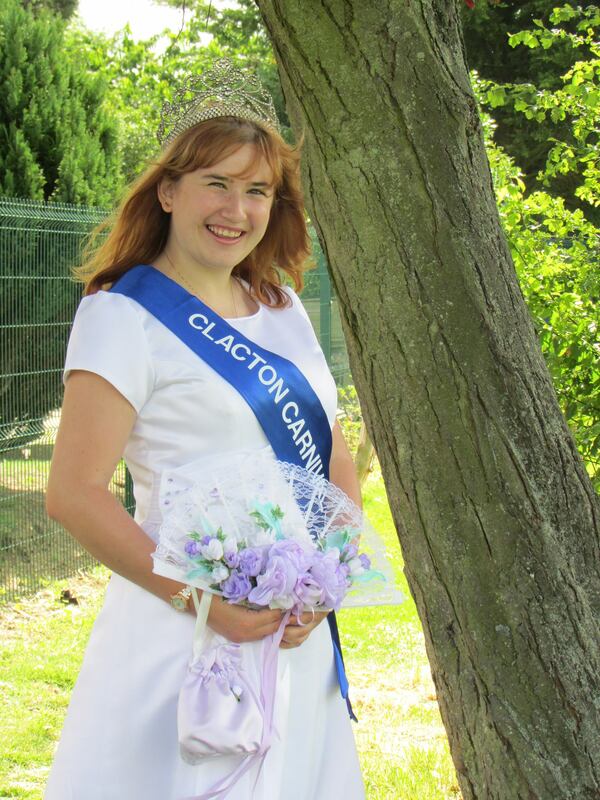 Kaycie and I decided to represent Clacton anyway, but we needed a stand-in Queen - which was a massive pink unicorn by the name of Star, which my aunt kindly loaned to us for the day. As Kaycie and I arrived at Felixstowe, we were greeted by their beautiful Carnival Court and had a photo with them. K: We also got to meet a Carnival Court from Felixstowe's twin town in Germany. The German Court were all adults and wore ornate clothes that looked like actual royalty from mediaeval times. We were one of three Courts in the procession, but Felixstowe do not formally judge their visiting Courts so no prizes this time. H: My friend's majorette troupe, Urban Allstars, won first prize for the dance group category! The carnival itself was very long - two hours of waving but the sun shone for the whole time we were in the carnival which made our day. Star the Unicorn was extremely popular. K: After a cloudy start to the day the weather turned sunny just in time for the procession! Everyone was very friendly and as we went through the centre of town, they announced our float and advertised our carnival. Throughout the procession the people watching seemed so happy and gave it a real sense of community spirit, which I thought was brilliant. We had so many compliments and so many people said thank you to us for joining their procession. You could also hear lots of people reminiscing about Clacton and planning return visits. We had so much fun - before, during and after the carnival. Thank you to Vicky, Hannah's mum, for making our hair beautiful again; thanks to Debbie and Jenine, who chaperoned and drove our beautiful float; thank you to Ellie (my mum) for driving us to Felixstowe and back; thank you to everyone who visited the carnival, and special thanks to Star the Unicorn for being a fantastic addition to the float! The day had finally arrived… our own carnival! We were all in high spirits as I arrived at Airways Hair Salon early in the morning meeting up with my princesses that I haven’t seen for a few weeks so it was nice to be able to catch up with everything before tonight. Airways did our hair so beautifully. Then around noon, Myself and Princess Kaycie meet up again at Indiglo to have our makeup done. Everything was done so amazing and made us all feel like actual royalty. Hair, Makeup, dress on. We were all ready to lead our procession. Our chaperone Carol picked us all up and headed down to west road carpark where all the floats, visiting courts and committee members was waiting for the procession to start. As we arrived, Carol said we must arrived in style, so on our run up to the carpark, all you could hear was a car beeping its horn making us all burst into laughter. As soon as we got out of the car and put our crowns on, we headed over to where the other courts were waiting and spoke to them all, thanking them all for coming. We even secretly took a card around for all the courts to sign because it was Sudbury’s Queen birthday, after making sure everyone had signed, we headed over and looked at the other floats that had all been done up so lovely. As judging started, we headed over to the judges table where the trophies were, waiting for this year’s winners to be decided. As the winners came over and claimed their prizes, it was nice to see every winner individually knowing how much time had been spent by everyone. It was especially nice to see my old guide unit not just win one trophy but two. As the final trophy was handed out. It was time to head back over to the float to take our seats before the procession started. Along the route I saw some very familiar faces to me, it was nice to see so many people come out and support their local community. I say there weren’t really anyway along the route where no one stood. As we got to the end of the procession, all our hands hurt from waving and jaws hurt from smiling. It was time to head off to Queen teas where we greet all the visiting courts into the hall and thanked them all for coming once again. After doing my queen speech, and giving the card to Ashleigh, we all sat down and ate the amazing food that the ladies of the Inner Wheel and their helpers had sorted out for us. It was time to say goodbye to everyone. As court by court headed home, we wished everyone a safe journey home as some courts had travelled a long way, especially the courts of Corby and Invicta Kent. We had a lovely chat with the ladies of the inner wheel, where we had learnt that Rainbow Nursery had kindly donated all of the flowers that where in the middle of every table, which was all beautiful. One last goodbye, we all headed our separate ways to each other and headed home to prepare to our next event tomorrow. I would like to take this time to thank Carol, Mum, Ellamy, Airways, Indiglo, The ladies of the Inner Wheel, rainbow nursery, all the entries and volunteers. A special mention goes to my Dad and big sister Kimberley for organising and getting today event all together. Next event: the Clacton Carnival Car boot! Today, our event was the car boot. I headed up early in the morning to help set up the field for the event. It was nice to see so many people who were eager to support this event. When the girls arrived, we walked around the field to see what everyone was selling, we managed to all buy a me to you small bear and a bow each, and then decided it was time to go back over and get some raffle tickets and sell them to people, we did a amazing job if I don’t say so myself. It was also amazing to hear in the middle of the event that £3.591.95 had been raised just on last night’s procession. As the field started to clear, it was time to say goodbye to everyone. It was such a nice afternoon with everyone. A big thank you to Carol, the committee, volunteers, buyers and sellers for coming today. A special mention to committee member Denise for organising today. Today was the donkey derby. This event is one I always look forward to, especially for this year as I was doing something that I always wanted to do, this was to start the races of. As we all arrived on the field. We were told on how to hold the flag properly and how we will start the races of. As the gates opened, we headed over and sold a few raffle tickets before we had to move out the way to let the donkeys in the gates as they were a little late, but that doesn't matter as they got here before the first race was going. Soon, it was time to take our place in the middle of the arena. As we started the last race all together, we congratulated the winner, and was soon on the way home. A few thank yous: Carol (our chaperone),the committee and the volunteers, a special mention to committee Member Laura for all your hard work making the donkey derby having. Our next event: Sandcastle competition! Today's event was split into 2 with 3 different events. The morning event was the annual Sandcastle competition sponsored by the Pier. We arrived earlier then usual so we could help set up for the event, as I helped hammer the stakes into the sand, Kaycie and Hannah helped bring the signs down for each section so the children knew what section was for them to build their sandcastles. Soon it was time for judging. Myself and Kaycie went and judged the 7-9's and the 10-14 year olds, when Hannah and Jenine judged the under 6 and the pairs category. Judging was not an easy job at all as every castle was built with such hard work, finally, with great difficulty, we all came to an agreement on who should win each category. After the hula hoop competition, it was time to announce the winners. One by one, the winners came and got their medals. Soon enough all the winners was announced, it was time to go back home and get ready for the evening events. Special thanks to Carol, the volunteers, the committee, Jenine, and everyone who came and took part. Special mention to Susan who put together the whole event. After a few hours, it was soon time to get picked up for the egg throw and beer dig. It was such a nice feeling to see so many people come out and support the annual events. We sold lots of raffle tickets before it was time to have a little go at the egg throw ourselves. And let me tell you right now, Mine and Kaycies egg broke straight away in the first throw, although we laughed at it because we both said it was going to happen. Hannah and my sister lasted a little bit longer than us, before the egg broke all over Kims arm! I couldn't stop myself from laughing. Soon after the winners was announced, we took a photo and gave them their prize money, It was time to start on the beer dig, where all the tokens were placed in the sand, it was the bell that rung signalling the start of the beer dig where everyone rushed onto the sand and started to dig for the tokens, soon enough, the special prize token was found, we took our photo with them, making sure to congratulate them. As the sky started to go to night, we decided to call it a night and head home. Special thanks to Carol, the volunteers, the committee, Jenine, and everyone who came and took part. Special mention to Peter who put together the whole event. Next event: Carnival Adventure Golf at the Greensward cafe. I was really looking forward to this event as it was the carnivals new event of the year, and it did not disappoint. We got picked up just before 9 by Carol and made our way to the Greensward cafe where the event was being held. It was so nice to see so many people who came and supported the event, we even got to have a go. It definitely was a event where everyone was so relaxed and was just having fun, especially for familys, that was nice to see. Special thanks to Carol, the volunteers, the committee and everyone who came and took part. Special mention to Greensward cafe for letting the carnival use the adventure golf. Just because I'm carnival queen didn't mean I wouldn't help set up the field like I have always have done. So around 10ish, I walked up the field after having a bit of a lie in and helped set up the sideshows and helped lay out the prizes for the prize tent. Soon enough, it was time for the event to start. First thing we did was go onto the gates and sell raffle tickets to people coming into the event. We sold many tickets before deciding to go back over and walk around the field. We even saw people dressed up as characters, I especially liked seeing our great friends from events ever after, they were as great as usual! Also in this night, we drew the grand Carnival, as there was three prizes was given out, I got to take the first ticket out while Kaycie and Hannah did the 2nd and 3rd. I just like to thank everyone who brought a ticket. As the night ended, it was time to head home before tomorrows event. Special thanks to the committee members, Carol, Debbie W. A special mention to my Mum for organising this event. Our next event: Fancy Dress and Quiz Night! today worked like it was on tuesday, where we had one event in the afternoon and then another in the evening. The fancy dress was amazing, it was so nice to see so many people had made a effort with everyone costumes so the judges must have had such a difficult time deciding who the winners of each category was. As carnival queen, it was my job to get the children in number order and to parade them around so the judges got a clear view on everyone. After the winners was announced , it was time to head off home to get something to eat before tonight Quiz night. Around 7ish, we were all picked up again by carol, and headed back to St James where the quiz was being held. When we got there, it was nice to see so many quiz teams taking part, including 2015's Queen Kerryalice, it is always a nice thing to see a familiar face. As the night carried on, and a lot of running up and down the hall collecting everyone's answers in. Soon, it was time to announce the winner and to draw another raffle where the girls and I was selling some raffle tickets when everyone was arriving and during the break. Soon enough, it was time to head off home. special thanks to Ginette and Nicky for organising both of the events. Next event: Walton Carnival where we will be joined by our special friend, Queen Aliya from Great Bentley! On the day where there is no carnival event of our own, we decided to go represent Clacton at our neighbour carnival Walton. We were all excited to go after such a good week in Clacton. The day started around 11ish where we all met up at Hannah’s so her mum could do all our hair. As always, she didn’t let anyone down, making sure we all looked beautiful. After putting on our dresses, we were all ready. Carol then picked us all up and we made our way to Walton. When we arrived where we had to be as this carnival was a little bit different from the others we went to, we had our queen’s teas before the procession. We were there for a couple of hours where we were all dancing and talking to all the different courts that we had become friends with over the year. After an afternoon of dancing, it was soon time to join up with our float ready for judging. After judging was over we were awarded best queens float! We were all amazed, we had won everywhere we went! What made it even better, Queen Aliya (who was on our float) from Great Bentley was awarded with Queen of Queens! We were all very happy for her. It was soon time to head up to the start of the procession, holding onto our seats, we were rushed up to the start so we were ready to join in with the procession. After talking to a few more people and taking some photos, it was soon time to start the procession. Along the route, I saw many familiar faces, that was very lovely to see, many of clacton’s committee members. Big smiles were plastered on all our faces. It was such a nice day to end a good but chilly day. A few thank yous go to Carol for driving us, Jenine for being our chaperone, Debbie for driving our float, Vicky and Ellamy for helping us get ready, Suzanna from Great Bentley who walked beside our float and Queen Aliya, you are amazing! Next event: The Clacton Half Marathon! It was the morning of our last event of Clacton Carnival 2017 and emotions were running high. Ellamy picked us all up just before 10am as Carol was unfortunately unavailable today, but we all had an good time. Kaycie’s little sister Danielle is so adorable. It was our job to hand out the medals to the runners. Everyone did such an amazing job. We made sure we congratulated every single runner. I would never be able to ever run a 10k, let alone a half marathon! As the last runner came in, everyone clapped and it was soon time to head home. If I had one word to sum up the whole week, it would be perfect. Since I could ever remember, I had always wanted to be queen and being chosen to do it this year made my life. From being able to lead our own procession to selling raffle tickets (which we were pro at the end of the week if I say so myself.) So if you want to be queen next year, go for it… it is an amazing experience! Next event: Great Dunmow Carnival on the 16th September! After just over a month after our own carnival took place, it was time to go to our next carnival at Great Dunmow and I was very looking forward to seeing everyone again. After an early morning start, it was soon time to head up the A12 towards Great Dunmow. As we got there, it was nice to see so many familiar faces that I have met during this experience. While we waited for Queen Katie and the rest of her court to turn up, Kaycie, Hannah and I went and talked to other courts. After we made sure we had talked to everyone, we headed back over to our float before judging to have a bite to eat. While we were eating, I saw the Great Dunmow Court arrive so I decided to go up to them. After having a chat with them, it was soon time to go back over to my float again in time for judging. After judging, the run down to the procession had begun. Excitement filled the air and we weren’t letting the grey sky bring our spirits down, especially when we had Queen Aliya and her princess Scarlett on our float. As the procession started, it started to rain but we weren’t letting that stop us. It was extremely nice to see how many people who had come out to support the carnival despite what the weather was like. As the procession came to the end, it was time to head towards the arena with everyone else. After being paraded in front of the crowd, it was announced that we had won Visiting Queens court. We were so happy, we had won the entire day! I then went and collected the trophy we won. It was soon time for Queen teas where I gave a card signed by everyone and made the whole hall sing happy birthday to Great Dunmow’s Princess Elizabeth. After a bit of delicious food, it was soon time to say goodbye to everyone and head back home. I would like to take this moment to thank our chaperones Jenine, Hannah and Mum, our drivers Carol and Debbie, Vicky for doing our hair. 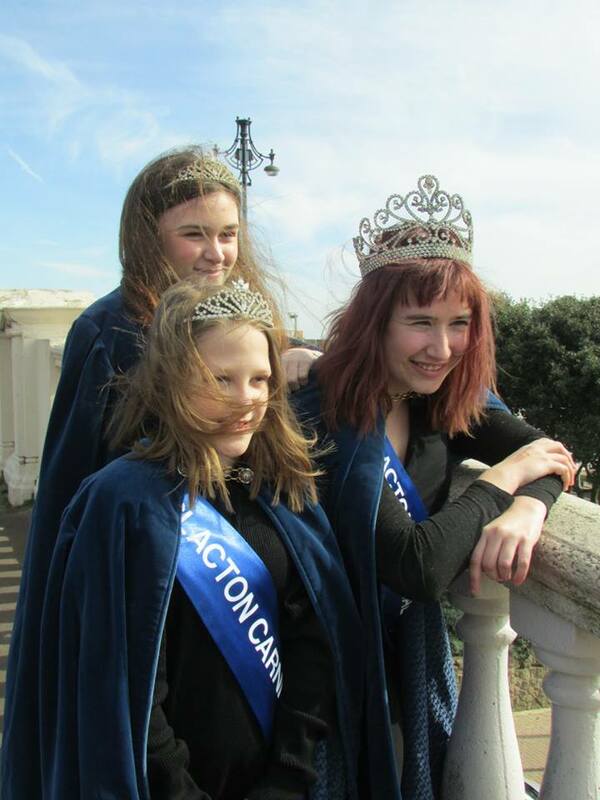 This morning, I woke up to the news of Princess Hannah being unwell, so it was just Kaycie and myself who represented Clacton. We started the day as normal going to Vicky’s, so we could get our hair done. After we finished, we head to Kaycie’s house to get ready where we decided we would travel in normal clothes with the distance Burnham is. As we got to Burnham, we got in our dresses and headed over to the Yacht club where queen teas were taking place to see all the other courts. It was lovely to be able to catch up with everyone. We also met the new Burnham court, who had been crowned that morning. After judging took place and I had eaten a lot of carrot cake, the winners were announced, although we didn’t win anything, Queen Aliya had won 3rd place queen of queens, we all were thrilled for her. It was soon time to head back over to our float for judging of the float. After float judging, and the sky started to turn to night, when some people came over with a skipping rope and everyone started skipping awaiting the start of the procession. We all had great fun, but it was soon time to get back onto the float for the procession. Just before the procession started, the judges came over and awarded us with 1st Place Tableaux. We were so happy, someone else saw the hard work and determination of the Davey’s who designed the float. It was simply beautiful with all the lit-up lights. After going along the carnival procession. Which has got to be my favourite by far (apart from our own), the way their community came together was unreal. You could see everyones smiling faces. It was soon time to head back home. Todays thank you goes to Vicky (hair) Ellamy (driver) Jenine (chaperone) Debbie (float driver) big Hannah (Chaperone) and everyone else! Next event: Witham Presentation Evening! This evening, I got to go collect the trophy we won at Witham back in July. I was the only one who went out of the court as my two princesses were busy doing something with their guide unit, but Debbie W, Mum and Myself still had a brilliant time. I had brilliant time dancing with my friends that I made through the year, especially Katie and Elizabeth from Great Dunmow. A few thanks you to Debbie and Mum for coming there with me, everyone at Witham Carnival for inviting us to their evening and everyone else who was involved! Next event: Clacton Carnival Presentation Evening! Now, this was the event that I had looked forward to. It’s the night that we give out the money that was raised from carnival week to worthy local charities that had helped during the week by marshalling a road to running a sideshow. A total of £7,343 was given out to our local charities keeping the money that was raised in the local community which is very important to me. The evening started when our chaperone Carol picked my mum and I up and headed straight to the venue because as parents were invited to come along that night, the princesses came with their families. It was a fantastic evening and seeing how the money was going to help the different charities which put a smile on my face. As the last cheque was handed out, it was time to take some photos with some of the charities, including the representative from the main charity The hospital hopper bus. It was soon time to say goodbye to everyone and head back home. It has been a brilliant year and this was a perfect way to finish it! Emotions were running high for our last carnival for the year, so we all made sure we went out with a bang. The day started after getting picked up after working the lunchtime shift at work. We headed to Hannah’s so Vicky and Ellamy could do all of our hair and make up. As this was our last carnival and we weren’t getting formally judged like the other carnivals, we decided to ditch our crowns and dresses for dress up. And as per usual, they made us look incredible. With us running late, Carol picked us up, heading to my house to pick up mum, we headed to Harwich. As we got there, we saw our float all done up in a Halloween theme for the carnival. We absolutely loved it! We got on our float and were judged. Soon enough, the procession started, and we danced all along the route, simply enjoying our last time on our float. As the procession came to end, we found out that we won 3rd place for small firms and organisations, soon it was time to say goodbye and head home in separate cars as both princesses went with their Mum’s. A huge thank you to Carol, Mum, Debbie, Jenine for being with us during the carnival. A big thank you goes to Vicky and Ellamy for their hard work during the year. Father Christmas at Clacton Asda! A surprise event! A few days before hand, the carnival had a phone call from Father Christmas saying that he needed Carnival’s help to bring happiness to all children. With that, I had to volunteer to help! So for the next few days, I was there with some of the committee giving joy to everyone. I enjoyed it! Thank you goes to Asda, Dad, mum, Kim, Izzy, Jay (last year’s Queens Mum,) Alan Penney, Gary, Ginette and anyone else who supported us!